Run Time: 123 min Rated: PG (Canada) Rated PG-13 (MPAA) for intense sequences of violence and action, some disturbing images and thematic material. Francis Lawrence's The Hunger Games: Mockingjay - Part 1 is the third movie in the film franchise based on the popular Suzanne Collins 'The Hunger Games' young adultsbook series. Picking up after the events of the second film, The Hunger Games: Catching Fire(2013), the central character Katniss Everdeen (Jennifer Lawrence) finds herself under the care and custody of the people of District 13 who are waging a covert war against the Capitol and its leader President Snow (Donald Sutherland). The District 13 government lives in an underground military facility and is ready to move from its largely covert war efforts to a more active assault on the Capitol. However, it knows it can’t wage a war on the Capitol alone and desire the participation of all the people from the twelve other districts. Unaware of the efforts mounted (behind the scenes in the last film) to rescue Katniss from President Snow's plot to have her die publicly as a corrupt and failed symbol of hope, Katniss discovers she was rescued for a purpose. The District 13 leadership and its leader, President Coin (Julianne Moore), want Katniss to be a revolutionary figure to whom the put-upon peoples of the other districts can rally and who will inspire them to join the revolution against the Capitol and its evil president. Katniss begins the film as a reluctant participant in this effort, unhappy with not being told about the plan which ultimately rescued her from certain death in the previous film. She feels great guilt that Peeta Mellark (Joshua Hutcherson), one of her love interests and fellow Hunger Games victor from her home district, was not rescued out of peril when she was rescued. As Mockingjay - Part 1 unfolds the audience quickly sees that Peeta like Katniss is being used for propaganda purposes. However, unlike Katniss there is a strong suspicion he is not a willing participant—a suspicion driven by his publicly transmitted interviews on behalf of President Snow and the Capitol. Katniss finally agrees to participate in the production of propaganda for the rebellion only if an attempt can be made to rescue Peeta from the Capitol along with others presumably being held captive. Plutarch Heavensbee (Philip Seymour Hoffman), the Head Gamemaker in Catching Fireturned revolutionary propagandist, discovers that Katniss' strength as a revolutionary figure is found in her spontaneous and emotional reactions to unfolding events—a quality that can't be effectively reproduced on a secret revolutionary bunker sound stage. As a result, Katniss is sent out into potentially dangerous environments with an embedded film crew to capture those hoped-for moments of inspiration. In a way, she is being sent out like a sheep in the midst of wolves. Although she can handle herself in a fight, her sheep-like vulnerability lies in being singled out and pitted against much grander and more ravenous enemies who want to destroy her. The rebellion's hope is that if the districts’ people see a lone young woman, who they already idolize because of the Games, stand up to President Snow then maybe they too will have courage to stand up against him. Still, the ever- building hope that characterized the second film seems to have largely levelled off in this third film and over all, the feeling of this film is bleakness which isn't too surprising considering its dystopian post-apocalyptic backdrop. Katniss' willingness to put herself in harm’s way for the good of others makes her as “innocent as a dove” but she and her fellow revolutionaries know they will need to be as “wise as the serpent” President Snow if they hope to win against him. President Snow is literally described as a “snake” in the film and his mode of attack is revealed to be poison. While he at times wears a pristine wardrobe of white on white, the inside of his mouth is said to be riddled with physical wounds from his poisonous attacks. Christian viewers may be reminded of the Scriptural description of how "Satan disguises himself as an angel of light"and how Jesus describes him as "a murderer from the beginning," one who "does not stand in the truth, because there is no truth in him. When he lies, he speaks out of his own character, for he is a liar and the father of lies." This film can give its viewers the opportunity to think about the nature and ethics of propaganda. Is it legitimate to fight fire with fire? Is it possible to use propaganda in a positive way? What would that look like? Even in the context of this film the revolutionaries are not free from using propaganda to manipulate. At one point, as she grieves in the aftermath and destruction perpetrated by the Capitol District against her people of District 12, Katniss sings a rather morbid song from her childhood in which the line "Are you, are you coming to the tree? Wear a necklace of rope, side by side with me," is changed to, "Wear a necklace of hope, side by side with me." When Jesus calls Christians to deny themselves and take up their cross and follow Him it isn't to follow Him into physical warfare or open rebellion against a government. In The Hunger Games: Mockingjay - Part 1where many people die in open rebellion inspired and encouraged by Katniss Everdeen and her handlers, viewers young and old may want to ask how well that fits with their religious and political convictions. There is also an additional lingering question hanging in the air: Would President Alma Coin of District 13 be any better as Panem’s leader than President Coriolanus Snow of the Capitol? If viewers, along with Katniss in Catching Fire,were supposed to remember who the real enemy was in the second film they might want to take a good look at the one Katniss is fighting for in this new film. The Hunger Games: Mockingjay - Part 1is very different from the previous two instalments in the franchise. It’s almost devoid of the flashy dresses and opulent costumes of the previous two movies. There is no 'Hunger Game' in this film; instead the 'game' is played outside the arenawith the stakes higher as everyone’s life is on the line. Is it a really good movie? Understanding how hard it is to split a novel like Mockingjay into two parts means the build-up at the book’s early chapters makes up the entire plot of this film. All the way through it feels like the plot is coming to some kind of explosive ending and, while this film does provide an effective cliff hanger, it often feels like it's not getting anywhere fast. For a reference point it feels a lot like the first half of Harry Potter and the Deathly Hallows: Part 1 (2010). While this Part 1 is mostly a war of words and propaganda, the second part will likely be more action-packed. 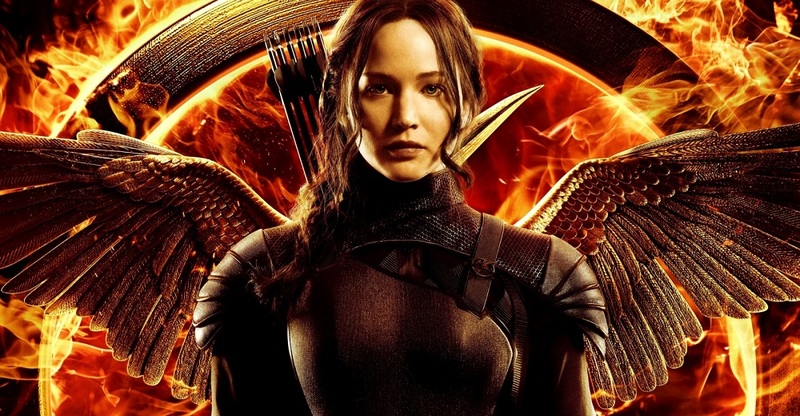 Fans of the Hunger Games franchise will likely enjoy the film and it will certainly tide them over until November 2015. The Rev. Ted Giese is associate pastor of Mount Olive Lutheran Church, Regina, Saskatchewan, Canada; a contributor to Reformation Rush Hour on KFUO AM Radio, The Canadian Lutheran and the LCMS Reporter; and movie reviewer for the “Issues, Etc.” radio program. Follow Pastor Giese on Twitter @RevTedGiese.